Esox Junior is made out of the best available materials and as strong and tough as possible. 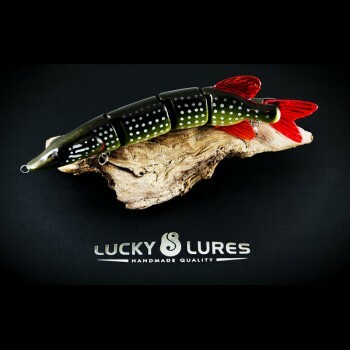 The body of this bait is made out of solid resin wich is pressure-casted at 60 psi, to ensure a bubble free and strong body, airbrushed with pearlized colors, installed with ss hardware, given multiple coats of hi-gloss epoxy and finally fitted with transparent hard fins - tough as nails. • All individually handmade - Made in Holland.